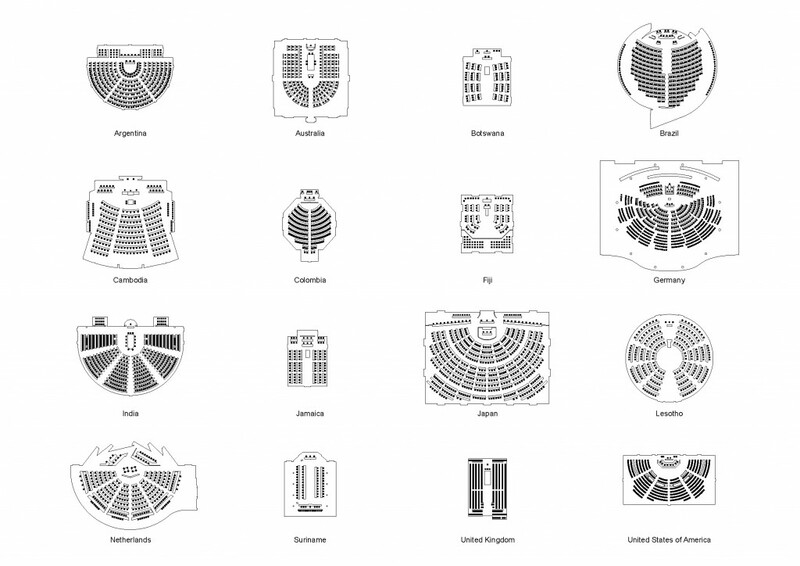 The relationship between politics and architecture is a complex one. The agency of architecture is often grounded in the symbolic and performative qualities of form, and its political power lies in the way these qualities produce and reproduce specific values, meanings, and uses. In the spaces that house parliament, politics takes shape. 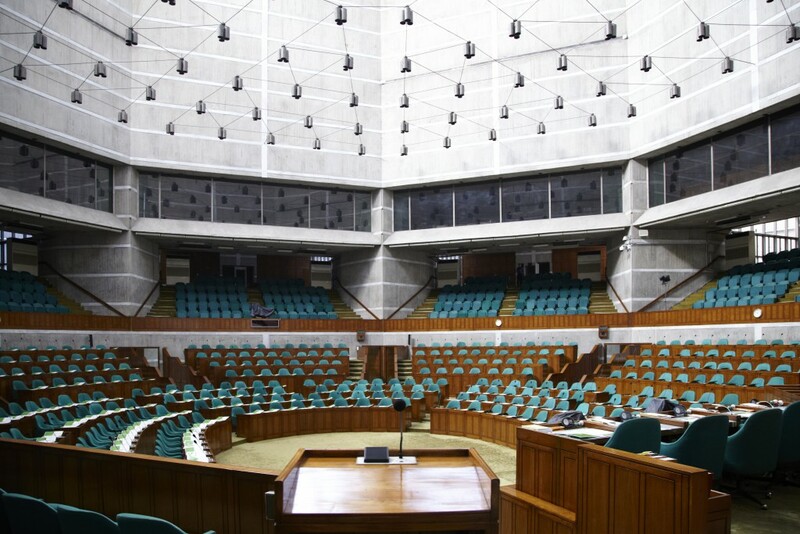 Within the architectures of these structures, officials congregate, collective decisions are formed, and relationships between political actors emerge. How do the spaces, settings, and structures designed for political assembly impact decision-making practices? How do they characterize the nuances in our political systems? Reading Images Series: Democracy invited us to explore the plenary halls of the parliaments of the 193 United Nations member states on the occasion of the launch of the book Parliament by XML. Participants traced differences and similarities between cultures of assembly, and made visible the symbolic and performative underpinnings of their architectures. In exploring these deliberative spaces, they questioned the role architecture can play in rethinking our models of collectivity, and in provoking the politics of our time. 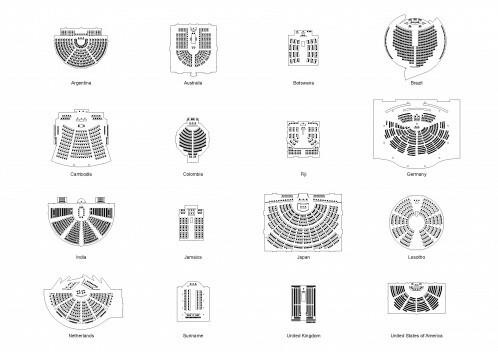 Since 2010, XML has researched and documented spaces of political congregation around the world. 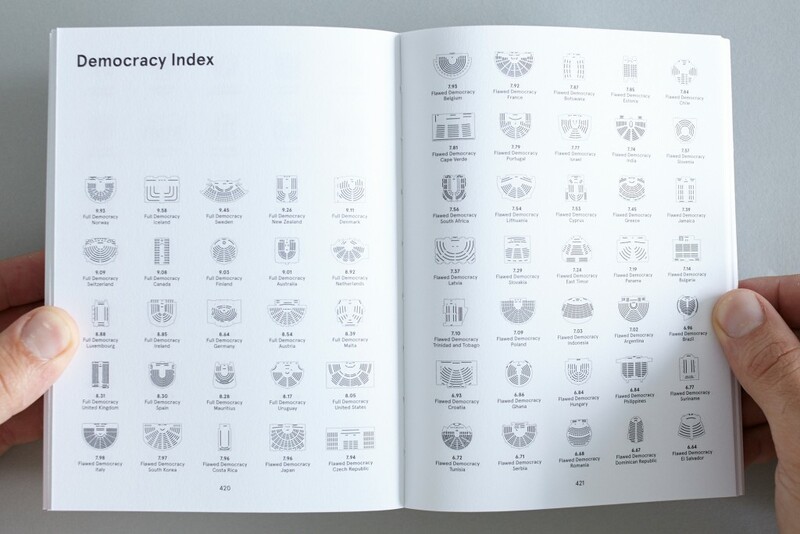 Organized as a lexicon, the book allows comparison of all 193 national parliaments in the world. 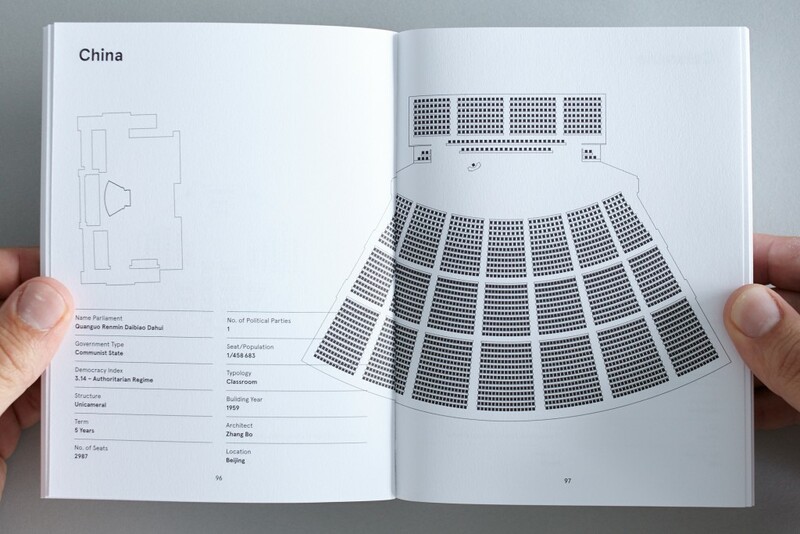 Similar to a manual archive, the book documents the rooms in the same style and scale, and also provides key data and the assembly hall’s location within the larger parliament building. 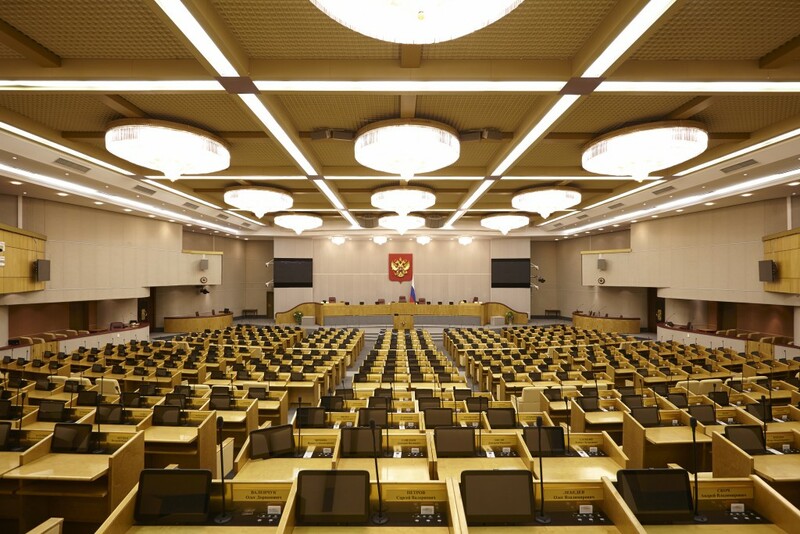 Comparing settings between East and West, North and South, democratic and authoritarian regimes, Parliament addresses the plenary hall of parliaments as more than mere ornamental, symbolic representation of national values, understanding them as active agents in shaping political culture and the future of our societies. Research associated with the book has been exhibited as part of the Venice Architecture Biennale (2014) and the Guangzhou Triennial (2015). 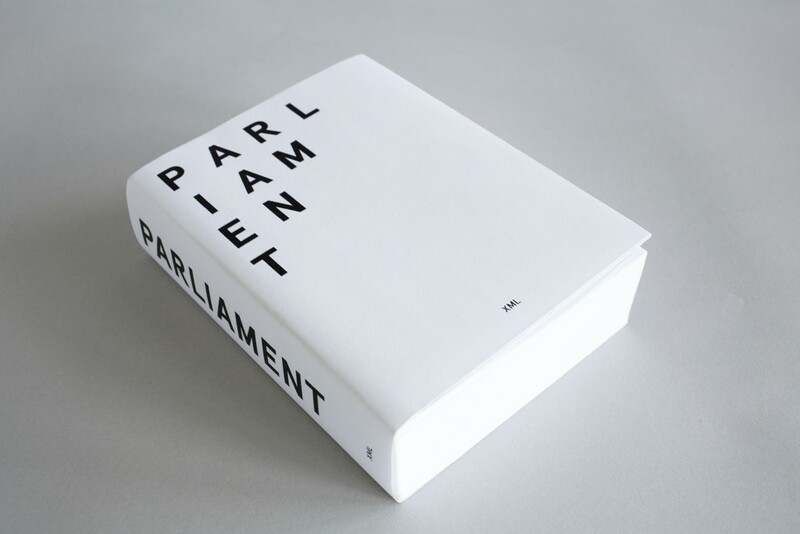 In parallel to the book, XML has launched www.parliamentbook.com to build upon the architectural typologies presented in Parliament. 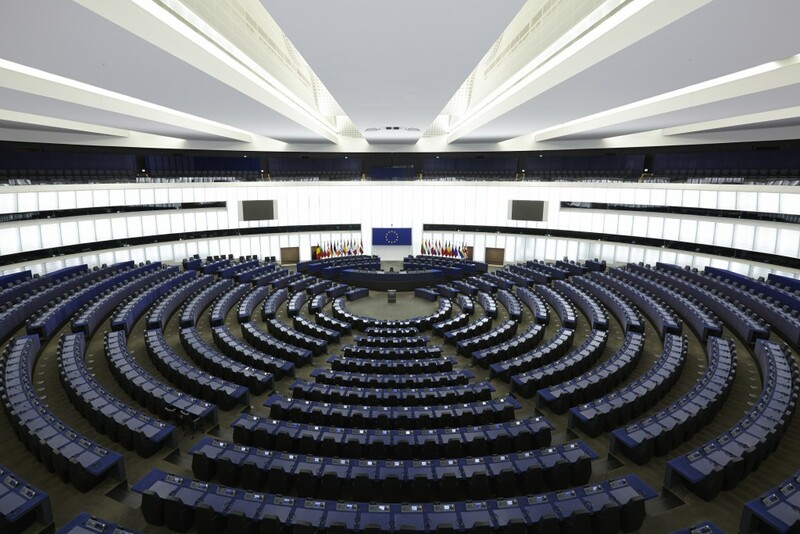 The website offers virtual 360-degree views of the interiors of various parliaments that were visited and documented as part of the research. James Graham is the Director of Publications at Columbia GSAPP, where he is also an Adjunct Assistant Professor. He directs the Columbia Books on Architecture and the City imprint, for which he has edited or co-edited a number of volumes, including Climates: Architecture and the Planetary Imaginary (2016) and 2000+: The Urgencies of Architectural Theory (2015). In 2014, he founded the Avery Review, a digital periodical of critical essays on architecture. His own scholarly work has been published in Grey Room, AA Files, Manifest and JSAH, among other journals. He also has degrees in architecture from MIT and the University of Virginia, and is a registered architect. Michael A. Manfredi is the co-founder of WEISS/MANFREDI Architecture/Landscape/Urbanism, a multidisciplinary design practice based in New York City that is at the forefront of architectural design practices that are redefining the relationships between architecture, landscape, infrastructure, and art. His firm’s award-winning projects include the Olympic Sculpture Park, University of Pennsylvania’s Nanotechnology Center, Barnard College’s Diana Center, the Brooklyn Botanic Garden Visitor Center, and, currently, a corporate co-location building at Cornell Tech’s new campus in New York City and the US Embassy in New Delhi, India. Manfredi is a National Academy inductee and has been honored with the Academy Award for Architecture from the American Academy of Arts and Letters, the Architectural League’s Emerging Voices Award, Harvard’s International VR Green Urban Design Award, and the New York AIA Gold Medal of Honor. He is currently a Senior Design Critic at Harvard and has also taught design studios at Yale as the Eero Saarinen Visiting Professor, the University of Pennsylvania, Princeton, and Cornell. Mark Rakatansky is Adjunct Associate Professor of Architecture at Columbia GSAPP and principal of Mark Rakatansky Studio. He is the author of Tectonic Acts of Desire and Doubt (Architectural Association, 2012). Other recent publications and interviews include “Palladio and Eisenman Redux: Outside-In,” in Constructs (YSoA, 2016) “Mark Rakatansky, Mark Rakatansky Studio,” Conversation with the Editors, in Project (2015); “Mark Rakatansky” in Form, Idea, Resonance: Thirty Years of Architectural League Emerging Voices (PAP, 2015); and “The Transformations of Giulio Romano” in Giulio Romano e l’arte del Cinquecento (Franco Cosimo Panini Editore, 2014). Current and recently completed projects include a cluster housing project, a townhouse, and the residence Permana in Jakarta. Malkit Shoshan is the founder of FAST, The Foundation for Achieving Seamless Territory. Her work explores the relationship between architecture, politics, and human rights. She is the author of the award-winning book Atlas of Conflict, Israel-Palestine (Uitgeverij 010, 2010), and co-author of Village (Damiani Editore, 2014). Currently, she is the curator of BLUE: Architecture of UN peacekeeping missions, the Dutch entry to the Venice Architecture Biennale. Malkit studied architecture at the Technion (Israel), and the IUAV (Italy). She is a Ph.D. candidate at the Delft University of Technology. Her dissertation explores the role architecture can have in conflict areas, focusing on UN missions. XML is led by two partners, David Mulder van der Vegt and Max Cohen de Lara who founded the office in 2008. Along side of their architectural practice they have taught at Delft University of Technology, the Academy of Architecture Amsterdam and at the Dessau Institute of Architecture. Currently, both partners are founders and directors of the two year Master Program ‘Designing Democracy’ at the Sandberg Institute in Amsterdam. Storefront’s programming is made possible through general support from Arup; DS+R; F.J. Sciame Construction Co., Inc.; Gaggenau; KPF; MADWORKSHOP; ODA; Roger Ferris + Partners; the Foundation for Contemporary Arts; The Greenwich Collection Ltd.; the Lily Auchincloss Foundation; the New York State Council on the Arts with the support of Governor Andrew Cuomo and the New York State Legislature; public funds from the New York City Department of Cultural Affairs in partnership with the City Council; The Peter T. Joseph Foundation; and by Storefront’s Board of Directors, members, and individual donors.